Blast from the past! Enjoy the exceptional setting of this light-filled holiday house. Recently restored, refurnished, and returned to its mid-century modern roots, this delightfully unique home sleeps ten. Lose yourself in an oasis of calm provided by uninterrupted views of ocean from the second story hideaway. Two minute walk to Thorne Lane dune cross-over to beach. Beach access unavailable during high tide. No Smoking permitted in or on the premises. 3 bedrooms, 2 bathrooms, two-level great room with panoramic ocean views, dining area, kitchen, single garage. MW, DW, W/D, 2 Sat TV's, USB Charging Ports DVD, WiFi/DSL, *GAS GRILL*. POOL PASS @ DAYS INN. NO PETS, NO SMOKING. BEDS: 3 Queen, 2 Single. Accommodates 8. We had a great time in Eastview. The property was clean and comfortable, as advertised. It is a bit dated with the décor, but there was someone there for a short time taking measurements; I assume to make some updates. We lost power for an hour or so one of the evenings and there aren't flashlights and very few candles. Considering the price and it being on the beach, I was surprised there were only a couple of old beach chairs and no beach umbrellas. We flew in so we couldn't bring that stuff with us. Would have gotten 5 stars otherwise. We had a great time however, I would recommend this place. If you want a beach house that has a really good view of the ocean, this is the one. Three of the four bedrooms have a view as well as the downstairs and upstairs living areas. There is plenty of comfortable seating in the upstairs glass room for watching the sunrise over the Atlantic with a cup of coffee. High tide crashes right up onto rocks in front of the house so there is no beach during high tide, as is the case on most of this island, but with this great view tou don't really mind. The beach access is close by and the neighborhood is quiet. The house and furnishings are clean. The kitchen had everything needed. The folks at Jekyll Realty are very friendly and accommodating. Property was as described - the upper "viewing" level was such a wonderful area to relax and enjoy the ocean. Each bedroom had a small view of the ocean, which was a nice surprise. Everyone in our group, from 3-73, enjoyed our stay. The home is clean, well kept, and the air conditioning is spot on! 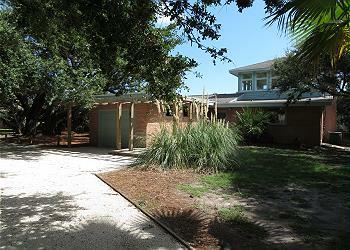 The home was located within one house of beach access which was great. At high tide, the water comes up to the rocks but that is a great time to go in the water because the bottom is hard sand. At low tide, the bottom is too mucky. The house is nothing fancy but has all the utensils you need in the kitchen. It is a pain to have to bring your own linens but I guess that's just how it goes on Jekyll. All in all, Jekyll is a great place for a beach vacation. The view from the upper room was awesome! My husband, son and 3 grandkids loved sitting up there watching the scenery and reading during the hottest part of the days. Only a short walk to the beach. Would choose this house again. We enjoyed our week at Eastview! The home was clean and comfortable. One of our favorite parts was the "upper room" where we enjoyed beautiful sunrises and, during the day, we enjoyed reading and watching the ocean from there. The living room and bedrooms also have ocean views. The outdoor seating area in the back is nice, and usually comfortable, other than through the middle of the day. We only left the island once! We discovered that we could purchase raw shrimp at The Jekyll Market grocery store, easily prepare them at home, and they were more delicious than the ones we had when we ate out. The kitchen was well stocked. I'm sure furniture is difficult to maintain in a rental, and the sofa did need to be cleaned. In the past, you could walk directly to the beach from the back of the home, but this year, there was a fence to prevent that, and we walked down to Thorne crosswalk. Not very far, but we did miss that. We would not hesitate to visit again. Jekyll Realty was very nice to work with. Nice house in a beautiful spot. This house has easy beach access over the boardwalk and it has a great beach view. High tide does cover the beach, so it's really nice to be able to see the ocean from the upstairs room. The kitchen is well stocked and the beds are comfortable. There is a big gas grill also. Everything is clean and well maintained. We did not have even one complaint. It was perfect. Six "girls" who graduated from college together more than 50 years ago rented Eastview and met up with another classmate who has a home on Jekyll. We had the perfect cottage and enjoyed it all! Excellent. The home is a perfect beach house with a heavenly view from big bright windows on the beach side of the home. We loved having coffee in the early mornings in the sunroom upstairs and on the patio outside. As cyclist enthusiasts, we loved the bike trail that was right outside the front door and circled around the whole island. The kitchen was well stocked, and clean with enough room for a couple of cooks to work. Our family made wonderful memories here and will certainly return. My husband and I and our six children ranging in age from 5 to 21 visited Jekyll Island for the first time all together and were thoroughly enchanted by the island's beautiful diversity. We especially enjoyed the non-commercial aspect of the island. Our rental house was spacious even for our large family and offered a beautiful view of the ocean which we thoroughly enjoyed. The proximity of our house to the beach provided many opportunities of convenient play and picture taking. We had the perfect vacation! The house was great! There was plenty of room for our whole family. Some of the adult kids got up early to run the miles of trails on the island. We enjoyed mornings on the beach, long walks and good food. We brought a bike and even bought a new one while we were there, so that we could ride on the trails. We enjoyed cooking and grilling. Liz Smith at Jekyll Realty gave us some good suggestions as to where we could buy fresh Raw shrimp. We also tried out some really good resteraunts. Two that really stood out were Iguana's on St Simons and Coastal Kitchen. Eastview is definitely on our list of favorites! Our daughter was married on beautiful Driftwood Beach so our family decided to rent a larger house. We were here from May 19th to May 28th. The kitchen is so well equipped we did not need anything. The view is awesome. We have been coming to Jekyll Island for many many years and this is the best house we have stayed.